Volvo has long been at the forefront of safety research, introducing the first three-point seat belt, as well as padded dashboards, front and rear energy-resistant crumple zones, childproof locks, collapsible steering columns, and rear-facing child seats. 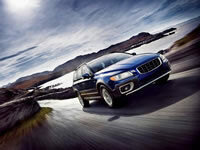 Today, Volvo vehicles also offer generous amounts of style and performance. Keeping your Volvo on a regular preventative maintenance schedule ensures it stays safe and reliable for you and your family through the long haul. Our multi-point inspections (included with any service) and honest approach to vehicle maintenance and repair see to it that your car is fixed correctly and at a fair price. Our Volvo service and repair shop is equipped with state-of-the-art equipment and diagnostics to best service your car. Give us a call today at (253) 604-4128 or fill out our contact form online.